Whether you enjoy riding a Harley Davidson motorcycle or not, it is fun to use and collect Harley Davidson collectible coffee mugs. The Harley mugs are available in many styles and designs to satisfy the needs of all types of coffee drinkers. Avon introduced a limited edition Harley Davidson color changing mug in 2007. When coffee, or any warm beverage, is poured into the mug yellow and orange flames appear on the previously plain black area of the mug. Above the flames is the classic Harley Davidson bar and shield emblem. This 11 ounce ceramic mug is microwave and dishwasher safe. A beautiful limited edition 11 ounce travel mug with an orange acrylic exterior with the words Harley Davidson Motorcycles. The interior of this mug is made of stainless steel. A stunning travel mug in gray and silver featuring the Harley Davidson wings and shield. A 14 ounce Harley Davidson covered thermal travel coffee mug with an iridescent orange exterior and a stainless steel interior. For couples that love to ride together, or just enjoy Harley Davidson motorcycles, a his and her coffee mug set is the perfect way to enjoy a warm drink together. These Harley mugs are beautifully designed with the Harley bar and shield surrounded by flames matching the color of the cups, a beautiful rose color for her and a brilliant blue for him. Each ceramic mug in this set holds 12 ounces and is dishwasher safe. 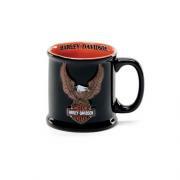 Harley Davidson collectible coffee mugs are available at many retail locations both on and off line. Collectible shops, gift stores and locations that carrying motorcycle gear are some of the places that generally carry Harley Davidson mugs. 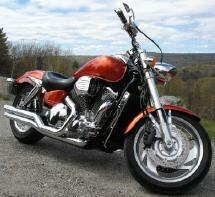 They are also often found at flea markets, auctions, motorcycle swap meets and specialty shops. Collecting Harley Davidson mugs is an enjoyable hobby that the entire family can enjoy.